To be quite honest, I’m not sure how to summarize this book at all. 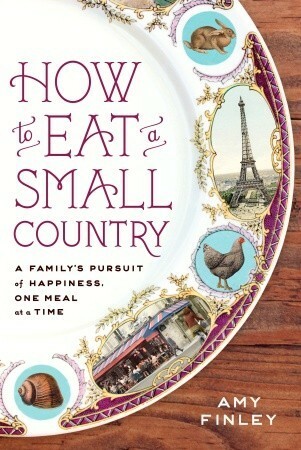 It’s about Amy Finley’s troubled marriage, it’s about how she makes her family go overseas to spend 6 months eating their way through France in an attempt to save her marriage. However, she doesn’t really talk about her marriage, or how this trip overseas resolves any of their problems. As a food memoir, the book is pretty decent. Finley provides some wonderful historical looks into the lesser known areas of Southern France. Provence usually gets all the accolades, a few specific cities in particular. I liked that I had no knowledge of the cities she visited and it was interesting to learn about the food history in those regions. Beyond that though, the book was disjointed, vague and the author’s tone was that of a petulant child writing in a diary than of a women trying to convene some sense of balance back into her life. Her descriptions and depictions of her family were horribly cruel. Her husband came off as controlling and somewhat mentally abusive. Although what he did and why he did what he did was never explained. She makes a casual reference to having won a Food Network Cooking show and having to choose between her marriage and career because he threatened divorce. She signed up for the show because she was bored and depressed at home. However, I don’t think either of them expected her succeed and he was particularly not ready for her to win and have a career in New York when they lived in Santa Barbara, California. I still have no idea what he did that shook up the entire family so badly that they had to go to France to save their marriage. Although her descriptions of food and the food history were enlightening, it seems like Finley had a penchant for picking mediocre restaurants for their trip. I’m still struggling to take seriously her 2 page complaint about a waiter having changed into his street clothes before leaving them with the bill at the end of his shift. Her children were poorly behaved in virtually every mention of their names and they by far seemed to have suffered the worst from the marital strife their parents were going through. I could go on and on about what this memoir is not. What it is though, are disjointed and vague thoughts about a struggling marriage. It is about Finley running away from her problems and not wanting to address them, only complain about them. What was she looking to find in France? She didn’t find it by the time the book ended. There was no resolution, there was no sign towards resolution. According to the book blurb, they are still married. So I guess they figured it out somehow.